What would you do if your shift started with this on your plate? Phone calls to the flare OEM do not get a response or the response is either too slow or not in the direction that will expediently resolve your flare crisis. You may just want an unbiased second opinion? We will work with your engineers to solve your flare predicament in a way that will minimise down time. 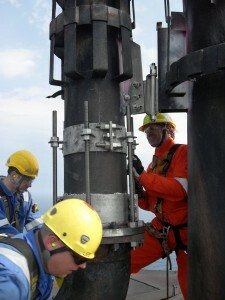 We have direct access to specialist flare-tip change-out contractors including those specialising in helicopter lifts. Or go direct to our contacts page and use any of the other mobile or landline numbers.